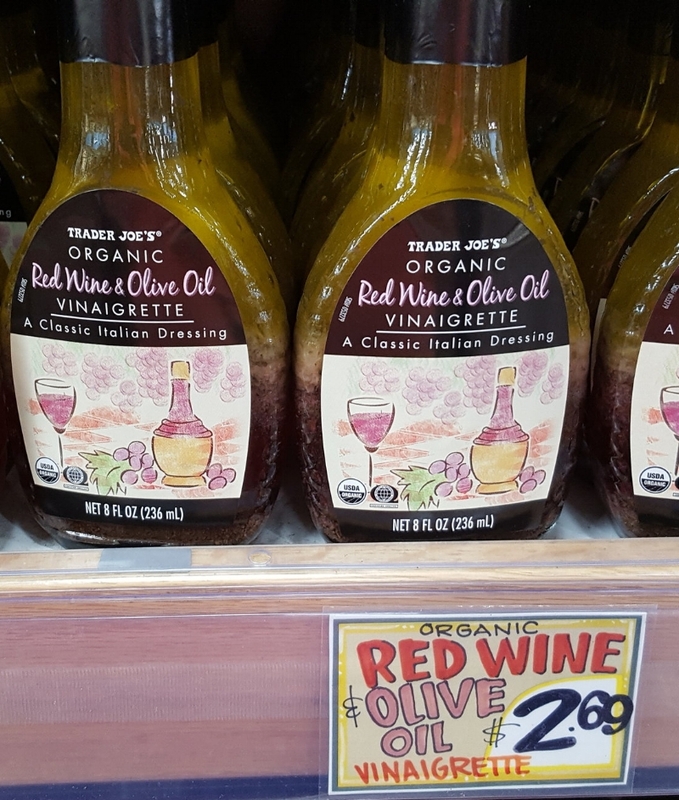 Trader Joe’s is one of my top favorite stores for finding healthy organic items without the organic price tag! I even wrote a post about it here! They’ve stepped up their standards considerably from when they used to have trans-fats in many of their products, though I still find a curve ball every now and then. In general if you just skip the goodies placed strategically at eye level down the frozen food aisle, you should be good! :D But these items below can be easily mistaken if you’ve gotten into the habit of not checking labels, like I sometimes forget to do! You’ll notice this is a healthy sounding Red Wine and Olive Oil vinaigrette, however if you flip it over you’ll see it’s cut with vegetable oil. Booo. Vegetable oil is because it’s cheaper but it’s also likely rancid fats and they’re high in omega-6 fatty acids. It’s easy to assume from the name that it’s a healthful, omega-3 olive oil dressing. But look closer and it kinda feels like a bait and switch! To be fair, TJ’s isn’t the only brand that does this, almost all other brands with Olive Oil on the label do this too. Another knock on this is the clear glass bottle. Olive oil oxidizes under light so it should always be bottled in dark glass. - Shopper’s Tip: Make your own vinaigrette and when you buy olive oil, buy it in a dark glass bottle and store in the refrigerator to keep the oil from going rancid. In a pinch I also use the Primal Kitchen brand of salad dressings that use avocado oil instead of vegetable and olive oil. Since it’s a saturated fat it’s very stable when exposed to light and oxygen so less worry about it being rancid. One of the more peculiar items I’ve seen in a while. Low-fat-butter, which is essentially low-fat fat… huh? How do you make fat, lower in fat? 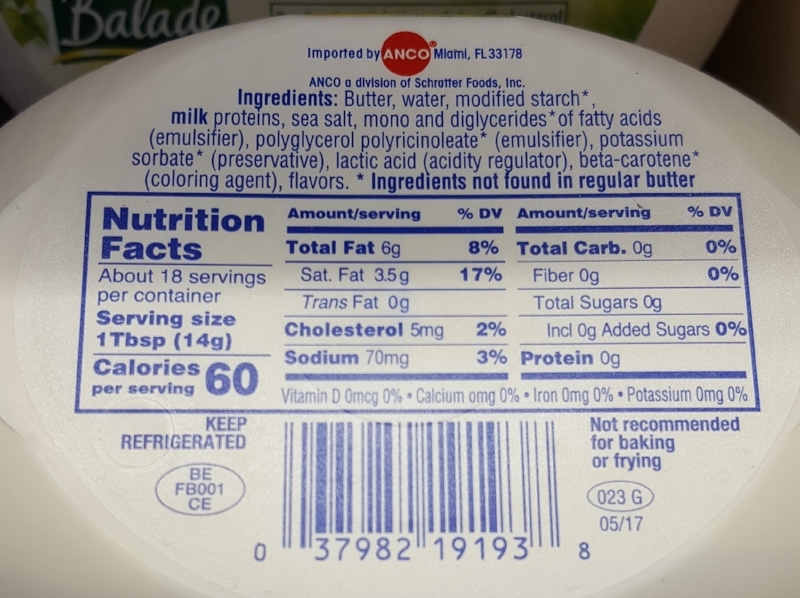 Well looks like this “light butter” is watered down butter with lots of emulsifiers in it to hold the fat and water together - since we all know, they don’t mix. But chemical emulsifiers are believed to promote inflammatory bacteria in the gut! -Shopper Tip: This odd concoction can easily be replaced by simply using less real butter. But you probably already knew that. I know this is a H U G E disappointment because so many people L O V E this stuff! However, with the TJ’s brand there comes a cost to that convenience; soy lecithin, flavorings and propellant! One reason I cook with coconut oil is to avoid soy and GMO-products so I don’t want soy in my coconut cooking spray. But that alone isn’t enough for it to make the list… butane is though! Propellants are deemed safe by the FDA but I just can’t get my head around having propane, n-butane or some other type of flammable gas in there - since they don’t have to list the type of propellant, we don’t know the kind used! It just doesn’t seem like something I’d want mixing around with my food. I’d have to guess that the gasses are evaporated as the oil comes out - but still, ick! And while I’m not totally against natural flavors, I wonder why they would need to add flavors to a cooking oil spray? Which most people want pretty flavorless. I can’t help but wonder if it’s there to off-set a flavor the propellants leave behind? 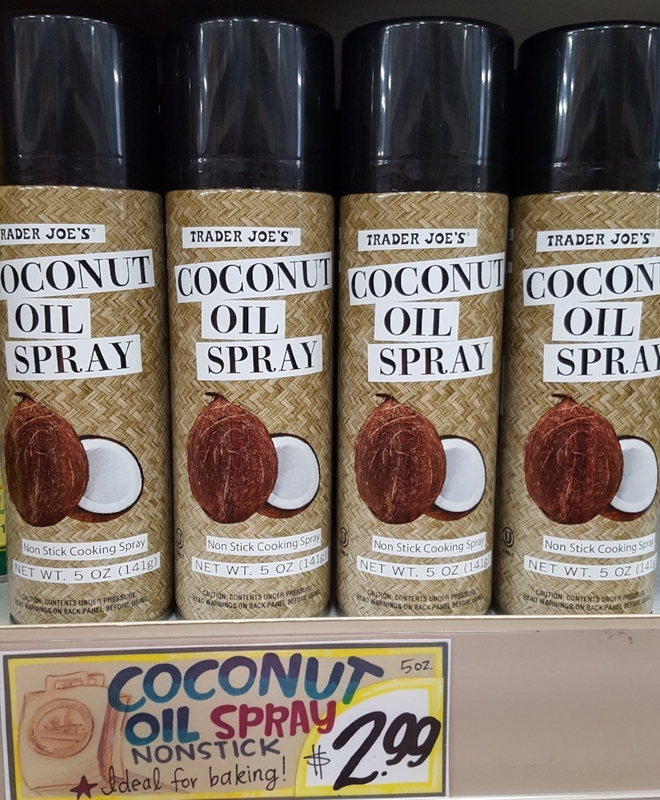 -Shopper’s Tip: I either cook with regular coconut oil, avocado oil or the Chosen Foods brand of cooking spray which doesn’t use any other ingredients except pure oil. There’s actually nothing wrong with this vinegar whatsoever! It’s perfectly fine to cook with, just not as a digestive tonic. The “issue” comes from the word “unfiltered” which is placed in plain sight but it’s usually seen in conjunction with the word “raw”. But this one is not raw! So the only thing “wrong” with it is that it’s not raw and can be easily mistaken for the health benefits of its superior, raw vinegar… if you’re not paying attention. If you want to read more about the benefits of raw, apple cider vinegar check out my post here. If you want Rose Water toner, buy pure Rose Water, not this. Rose water is a natural byproduct of the steam distillation process of making rose essential oil. It’s easily made from two simple ingredients; water and rose petals. As you can see, this product has a whole list of other ingredients… most of which by the way sound totally fine. Nothing wrong with some witch hazel, glycerin or quillaja saponaria bark - whatever that is. I just googled it and found it comes from the soap bark tree - whatever that is. But look closer, water is the first ingredient which gives a clue that it is watered-down rose-water. That explains why they have to add “fragrance” in addition to those, “-ol” ending ingredients; citronellol, geraniol, linalool, (which are fragrances too and could all be derived synthetically, we just can’t tell). And what’s holding it altogether is a scary sounding but relatively benign (at least by Skin Deep’s rating) preservative, phenoxyethanol. So if you thought you were buying a soothing rose water spritz you could be sorely mistaken. The concern here is all that added fragrance which could be terribly irritating to your skin. Less is more! Shopper’s Tip: I buy S.W. Basics Rose Water. It smells divine and has nothing but rose water in it. If you have purchased these items, use them and love them... Great! I just want you to be aware of what’s in them in case you thought you had purchased something more healthy sounding. And if nothing else, this is a good reminder to be a conscious shopper and always check the ingredient labels. It just takes a sec.